MK says proposed solution for hareidi military service will be no solution at all, thanks to early marriage in hareidi community. The Perry Commission’s report on hareidi-religious army recruitment does not offer real solutions, MK Eitan Cabel of the Labor party argued Friday in a post to his Facebook page. “Real equality means enlistment at age 18, without deferral and without ‘maybe,’” he wrote. 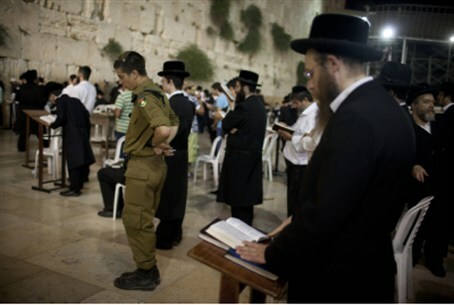 The proposed legislation would allow men to defer military service in favor of full-time Torah study for a maximum of three years. The IDF pays married soldiers a significantly higher monthly salary than that given to unmarried soldiers. The proposed deal is not good for hareidi men either, Cabel said, as it would mean they would be required to serve for 32 months, while those in the hesder program, which combines army service and Torah study in religious-Zionist yeshivas, would be required to spend only 24 months on active military duty. “This isn’t what we hoped for from the two ‘brothers’ who very quickly became a pair of old politicians,” he concluded.